The Moonlight Flit is going down. 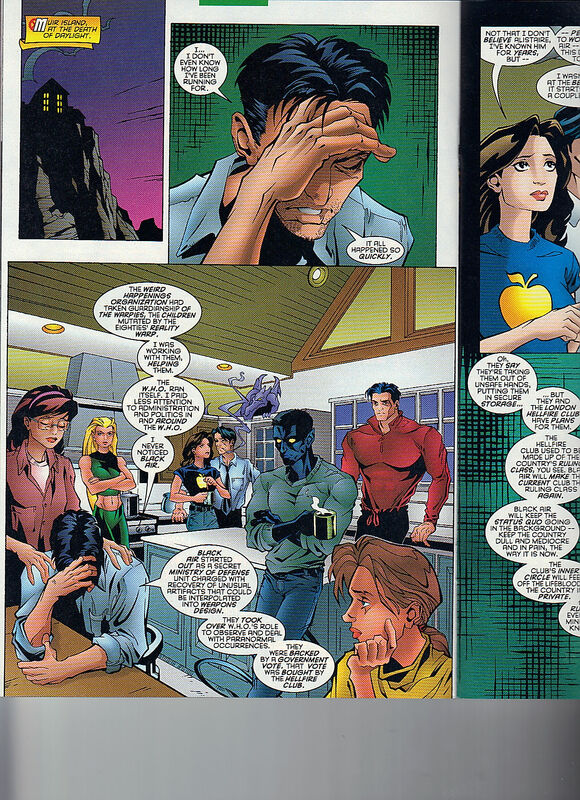 Kurt gets the plane to hover, and tells Meggan to fly out and handle business. Kurt teleports to one of the two choppers, and knocks out the pilot. Meggan goes after the second chopper. The second chopper is able to get a few shots off, forcing Kurt to teleport upwards. He shouts out in pain, as his power works better, horizontally. Kurt being hurt, sets Meggan off and she makes sure the second chopper goes down. London, in the Midnight Runner. Brian, Kitty and Rahne are on their way to meet the Hellfire Club. The ladies will stay in the plane and Brian will be in the meeting, by himself. X-Facts. The name of the Marvel Bullpen Bulletin. The X-Offices are having some changes. X-Factor penciler, Steve Epting, is moving over to X-Men Unlimited. Taking his place, will be Jeff Matsuda. X-Factor Editor, Kelly Corverse is getting a new assistant, Matt Idelson, as Jaye Gardner got promoted to Associate Editor for X-Man. Onslaught’s secret identity keeps being hinted at. On January 7, 1996 – Joe Madureira married long time sweet heart, Margaret Skeahan. Excalibur 97 – It’s an aerial battle the likes you’ve never seen when Nightcrawler and Meggan go head-to-head with British Intelligence’s Black Air! Plus, Douglock receives an injury that could very well cost him his life! And if that wasn’t enough — Alistaire Stewart actually seek’s Excalibur’s help! By Warren Ellis and Casey Jones! Muir Island. Douglock is beginning the process of merging with the ground. Moira checks in on him. Moira leaves Douglock’s side and runs into Pete Wisdom. Wisdom is hunting Lockheed and Moira gives up, as she is surrounded by nonsense. Lockheed has taken Wisdom’s cigarettes, the one thing he really needs in his life. Beneath London. Scratch is in the sewers, carrying the box that Sebastian Shaw gave him, last issue. He is about to open a century’s old door. London Hellfire Club. Rutledge, the manservant, takes Brian to the Inner Circle. He was a big fan of Brian’s father. Brian steps right into the meeting and takes his father’s seat. The Red and Black Kings are in attendance. The Red Bishoip starts shouting and challenging Brian, as there should only be the one Bishop. I like how Brian and the Black King ignore the Bishop. The Black Queen, no one gets named here, states that they wanted to distance themselves from the American Hellfire Club, and so they changed from White to Red. Brian backhands the Red Bishop and becomes the Black Bishop. Brian can’t tell who could be Mountjoy, which makes sense, as he doesn’t know how any of them acted before today. Muir Island, at the death of daylight. Must be a British term but I sort of dig it. Alistaire is holding his head in his hand and now he looks like Wisdom, good thing they gave him the Reed Richards temples, so that we can tell them apart. 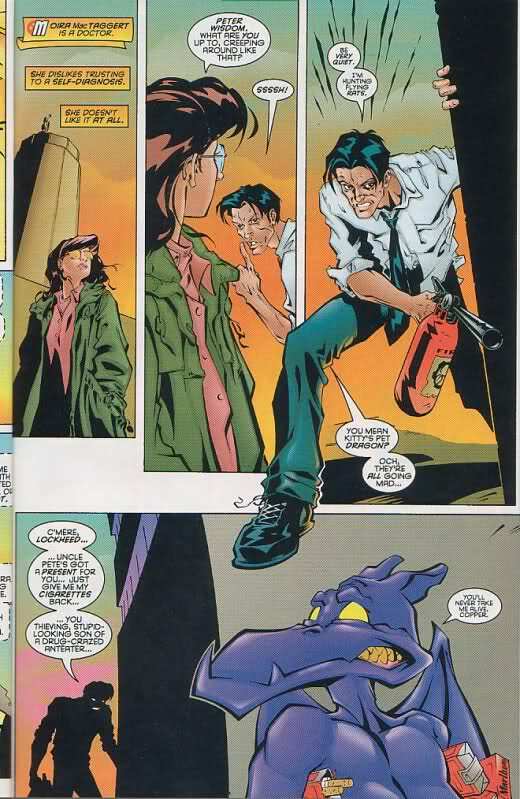 Look at that nasty look Lockheed is giving to Wisdom, so great! Alistaire explains, where he has been since the Davis / Farmer run. He was watching over the Warpies and WHO was running itself. Suddenly, Black Air started growing, from within and making changes. They got in charge, by the Hellfire Club’s influence on the government. Kitty asks if this information matches with what Wisdom knows about Black Air. Wisdom was’t there for the first days but it explains a lot, of what he knows. With one sentence, the Warpies are brutally killed by Black Air, and Alistaire has been running, ever since. I was’t a big fan of that arc, so I’m okay with this development. Black Air wants Alistaire and Excalibur dead, as he knows their plans. Outside, Douglock is still finding himself. A Black Air jet comes out of the clouds and harpoons him! As the issue ends. Swordstrokes, the letters page. Letters are from – Krista Schneidereit / Catherine D. Kobasiuk of Mastic Beach, NY 11951 / Mike McCullough of Selbyrine, DE / Tody Ingram of Colchester, Essex, England, UK / Olav Beemer of the Netherlands, Europe and Jeff Kozzi of Providence, RI. 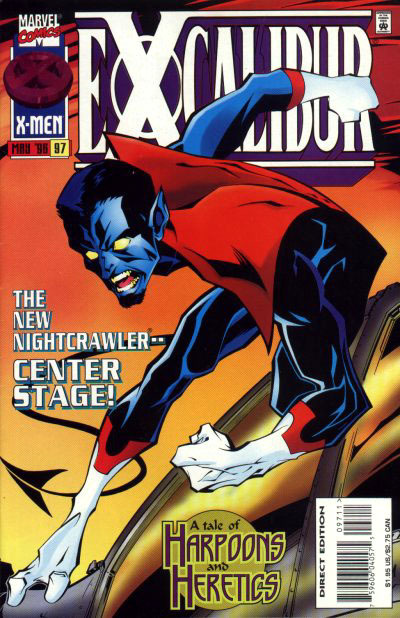 Next Month : Carlos Pacheco and Bob Wiacek are back as Excalibur searches for its lost teammate, Brian is seduced by the secrets of the London Hellfire Club, and Nightcrawler takes charge. We will be skipping 97 and going straight to the big issue 100! Back cover ad is for Spider-Man cereal, which I’m pretty sure, I ate a bunch of, back in the day.